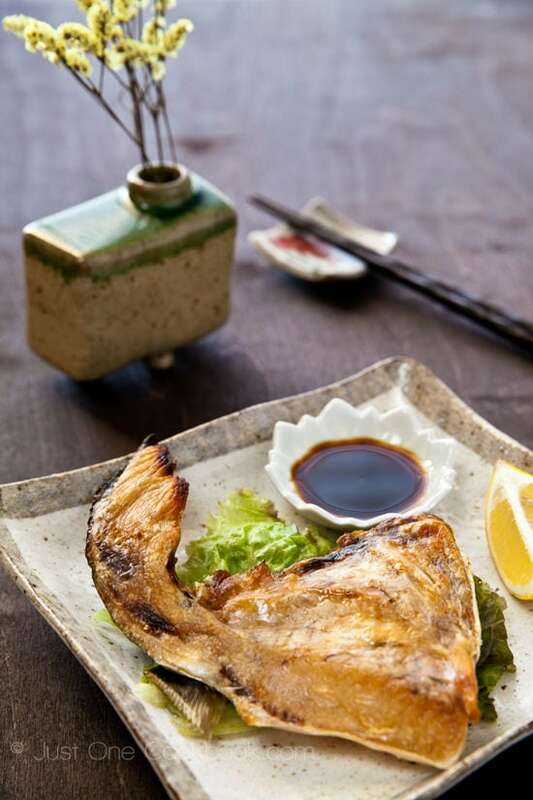 Hamachi Kama is the collar of yellowtail fish (Hamachi). 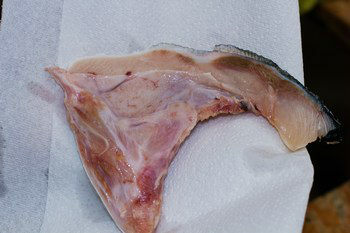 It is the most fatty and juicy part of the fish and there are two in each yellowtail (one per side). Usually it is grilled/broiled until the skin is crisp and the inside is just cooked through. You can easily scrape the flesh off the cartilage with chopsticks. One package of Hamachi Kama is always in our freezer. When I need one more dish on the table, I defrost the fish, put it in the toaster oven, and bake (or broil) for 25 minutes. By the time I finish cooking the main dish, Hamachi Kama is ready to serve! My kids LOVE this fish and usually eat almost all of it. 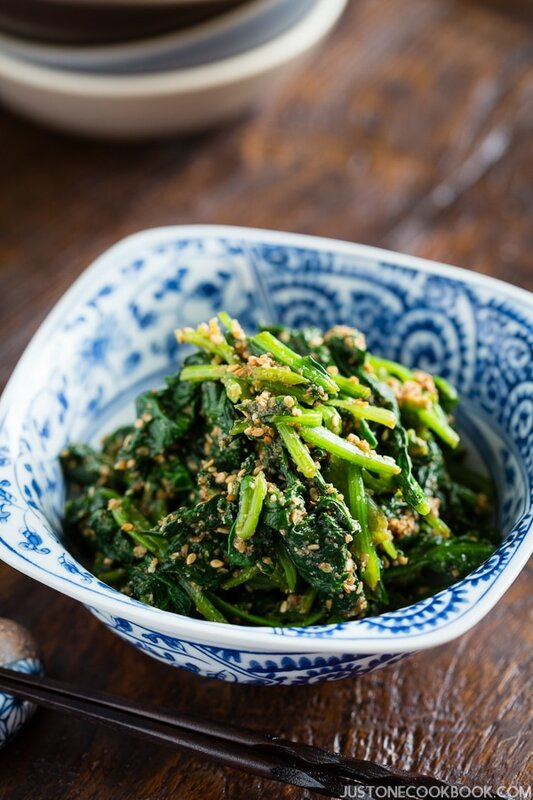 My husband and I haven’t had a taste of it for a while… I promise, the flavor of the fish (and easy cooking) is quite addicting! 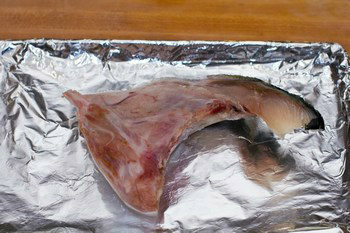 Quickly rinse the hamachi kama in cold water and pat dry. Cover baking pan with aluminum foil. Brush the foil with some oil. Place Hamachi Kama, skin side down. Bake at 400F until the top is nicely browned, about 20-25 minutes (in my oven toaster). Please remember cooking time varies depending on oven/toaster oven. 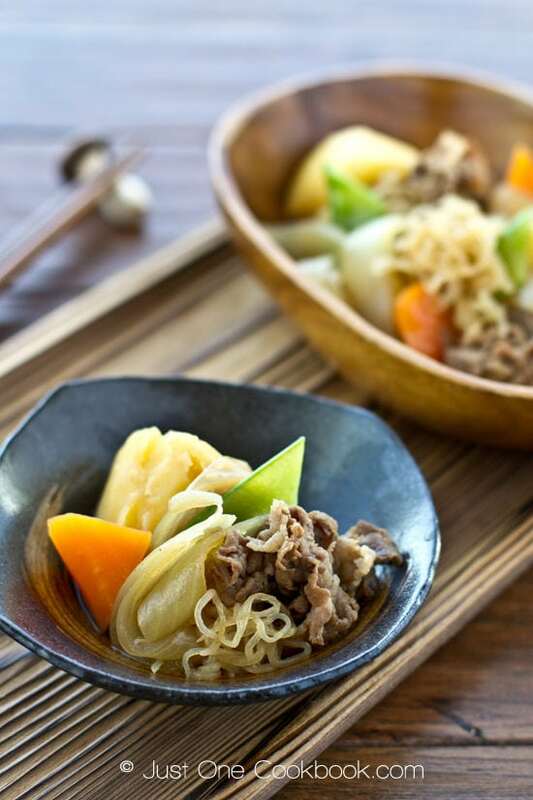 Serve immediately with lemon slice and a small dish containing yuzu and soy sauce mixture. Squeeze lemon over the fish and dip in the sauce to eat. Editor’s Note: Pictures updated in September 2012. Omg! This looks sooo yummy! Stan and I both love Hamachi Kama!!! Gotta try and cook this at home one of these days…I love it when there is no actual “cooking” involved! 😉 Thanks, Nami! Hi Ling! 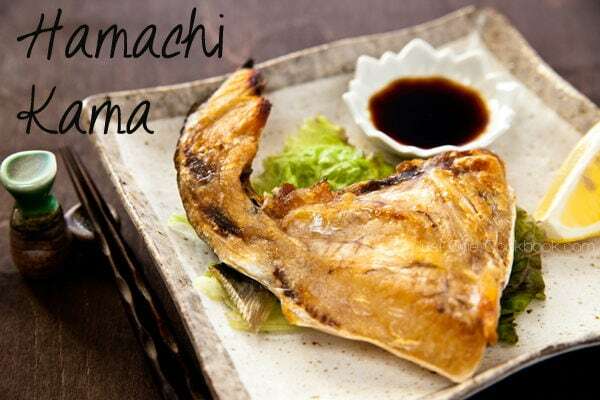 I know…after you start cooking, you will never order an expensive Hamachi Kama at a restaurant. It’s just not worth it. Please add Yuzu extract. I know it’s a little expensive ($6-8, I think), but Yuzu + soy sauce mix goes well with salmon fillet too. We buy salmon from Nijiya too. Just 25 minutes in oven toaster and dip in the sauce. Simple and yummy! Thanks for stopping by! I tried your recommendation for the hamachi kama that I purchased frozen from a great Japanese market in LV and broiled 4 kamas for 25 minutes and made the sauce with some ponzu , phillipine lemon infused soy sauce with sliced and diced scallions and Japanese peppers. Result: out of this world great!!! As avid Japanese food eaters we thought this was as good as any sushi restaurant we ate. 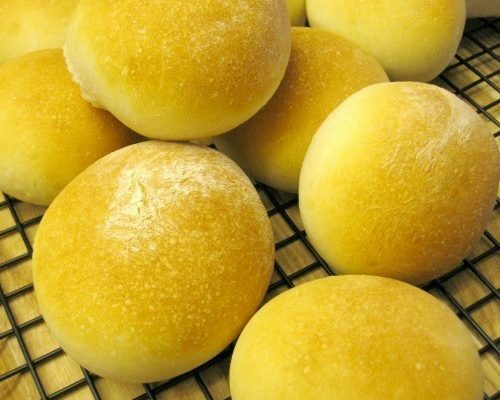 Very easy preparation which is always a plus and it does look very delicious! Thank you, Nami San! I went to the local fish market but was told no collar from big fish currently… 🙁 Will try your recipe when I find it. Wish you and your family a wonderful holiday season! My mom buys hamachi collar from local delivery service called “Osakana Club”. They have pretty a lot of kinds of sushi grade fish including kama at very reasonable price(much cheaper than supermarket and better quality). Try http://www.osakanaclubusa.com if they delivery kama to your area. I believe they do service around Bay Area (San Jose CA). This is the way I cook for hamachi kama 3 times a week. It is just easy and neat on the table. My family is running a sushi restaurant in San Jose. But many customers konw this fantastic dish, so my kids and I always have these gold from the hamachi. Thanks for the sharing, I will try your sauce on next time. Maybe the dish will give us more surprised. Hi Monica! Wow 3 times a week! That would be my kids’ dream. 🙂 I’d love to try your family restaurant in SJ. Let me know which restaurant if you don’t mind! Hi, do you have recommendations for how best to defrost the fish? Do you just leave it in the fridge to defrost? Leave it on the counter? Lukewarm water? Hi Sara! I usually defrost overnight in the refrigerator or thaw on the counter before cooking (unless it’s hot day). If I’m in hurry, I use cold (running – but small) water to thaw it out (until fish is “flexible” then cook. I do not recommend using a microwave. So happy to hear you enjoyed it! It seems like you had a nice Japanese theme dinner! 🙂 Thanks so much for your feedback! 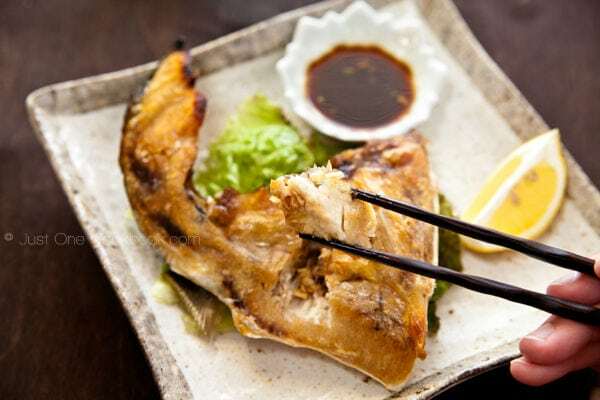 In general is Hamachi Kama in the fresh fish section of a Japanese grocery store or in the freezer section? Hi! I broiled mine yesterday and I felt it was a bit dry compared to the restaurant. Do you recommend baking over broiling? I think I may have broiled too long because my collar was a little less than half a pound. 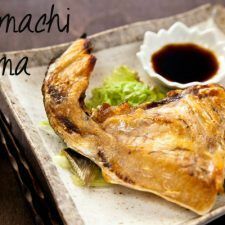 I will never order hamachi kama in the restaurants anymore! Thank you for the recipe! Just one quick question, after 20mins in the oven our kama was cooked but the skin and the edges were not crispy like what you have in the photos. Will you recommend to increase the temperature and keep the same cooking time? We love the crispy bits. Thanks again! my two cents: should probably put smoke oil on the foil. I tried this and the skin was entirely stuck to the bottom. Also cooking time for my oven set at 400 F was closer to 30 min. Hi Bob! We eat Hamachi Kama often at home but I often transfer the fish with aluminum foil… I’m going to write a tip in the instructions. Thanks for your feedback Bob! 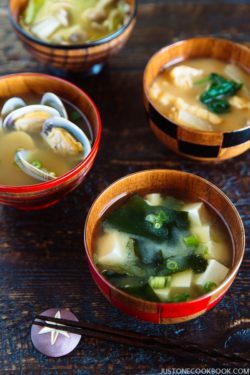 I made this yesterday along with the Shio Koji Kabocha and it was fantastic! Really loving your blog and easy-to-follow recipes. The Yuzu and soy sauce mixture is ponzu sauce. you can just get ponzu sauce if you cant find Yuzu.. which not all areas keep that handy. Hi Brena! I guess you could do that especially if you enjoy ponzu sauce. recipes and lessons. Not just the great recipes you share. But the step by step pictures. Thank you so much and Mahalo. Hi Charles! Your words are too kind. I’m happy to help! 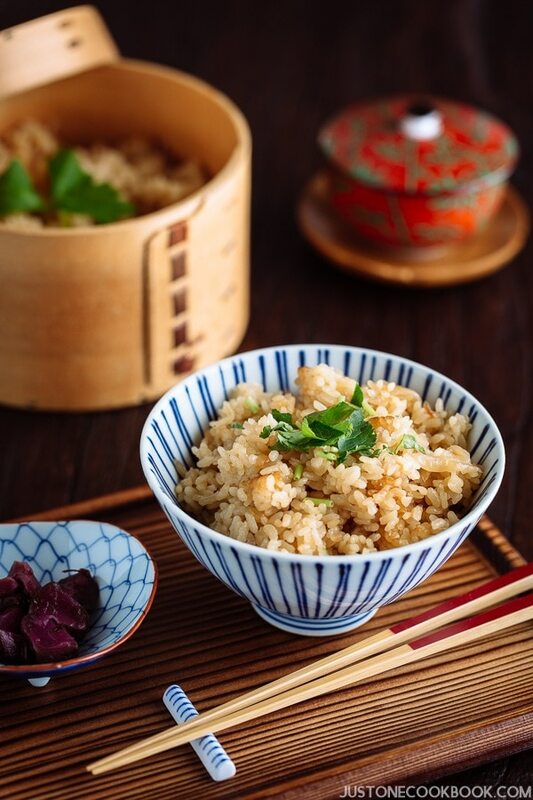 I’m just happy to share the joy of cooking Japanese food with everyone in the world. 🙂 I’m glad to hear my step by step pictures are helpful too (because it’s extra work… he he he).